By John Roemer, Special to the California Bar Journal In the 1990s, incorrigible reefer-puffing criminal defense legend J. Tony Serra was one of the few points where the law and marijuana use intersected. Serra used to inhale liberally and openly at his law offices most afternoons, citing permission from his physician, Eugene “Dr. Hip” Schoenfeld. Serra claims smoking pot countered the negative effects of stress in his work and once represented San Francisco’s Cannabis Cultivators Club in federal court. “Marijuana has always been my center of peace and stability,” he said. Federal anti-drug laws haven’t changed, but today’s culture and the justice system have evolved. 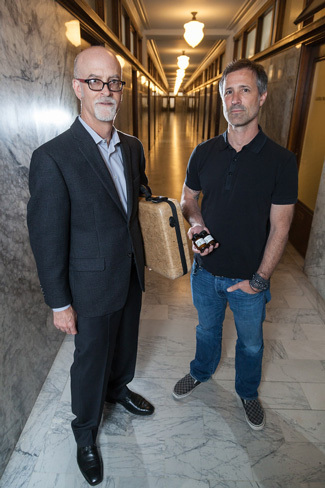 Once a rarity, Serra is at the forefront of the cannabis counsel vanguard, a growing set of buttoned-down lawyers advising a new wave of cannabis entrepreneurs grappling with the state’s marijuana regulation. Serra’s clients sought to operate medical marijuana dispensaries under California’s new Proposition 215, the Compassionate Use Act of 1996. But they came under assault by the U.S. Department of Justice, which refused to honor the state law. U.S. District Judge Charles R. Breyer cited the U.S. Constitution’s supremacy clause to enjoin six Northern California medical pot dispensaries as illicit under federal law. That was then. In October 2015, Gov. Jerry Brown signed a series of bills designed to regulate medical marijuana producers, distributors and retailers from seed to sale. A Bureau of Medical Marijuana Regulation, headed by a “weed czar” who formerly worked in alcoholic beverage control, is in the planning stages. In response, the pot defense bar has expanded into a galaxy of full-service practitioners ready to aid cannabis clients with taxes, corporate transactions, licensing, land use and zoning problems, Proposition 65 environmental issues and the thickets of regulations enacted by local governments. A green gold rush is on, and other lawyers besides Serra have spotted opportunity. In a shift that once seemed a pipe dream, 24 states have legalized medical marijuana, recreational use is likely to be on California’s November ballot and the old line San Francisco firm Farella Braun + Martel LLP has launched a cannabis practice group to serve as outside general counsel to marijuana-related businesses. Farella was one of the first full-service firms to establish a wine industry practice group when it opened a branch office in Napa County in the 1980s. Earlier, founding partner Frank E. Farella established Farella-Park Vineyards to make his own wine. Ryan D. Lowther, the Farella partner in charge of the new cannabis group, said he wanted to leverage the firm’s experience in highly regulated industries such as wine and alcohol beverages. Along with marijuana dispensaries, his clients include Poseidon Asset Management, a San Francisco hedge fund that deals solely in cannabis investments. Lowther said the firm is very conscious of the unresolved clash over pot between federal and state law. The U. S. Department of Justice’s 2013 Cole Memo told federal prosecutors to exercise enforcement discretion if local cannabis businesses are in compliance with robust state regulations. The Los Angeles County Bar Association’s Ethics Opinion No. 527 similarly warns lawyers not to violate federal law but otherwise greenlights advice regarding a client’s compliance with California’s marijuana statutes. Last June, business attorneys announced they had established a National Cannabis Bar Association. The campaign has many facets. San Francisco sole practitioner Patrick D. Goggin for years paid the bills by practicing personal injury law while he labored for a trade group to legalize nonpsychoactive industrial hemp, an ancient food, fuel and fiber crop, and differentiate it from its marijuana cousin. Today he said he’s awed by the changes he’s seen. In 2004, Goggin obtained a published opinion from a 9th U.S. Circuit Court of Appeals panel holding that the Drug Enforcement Administration cannot ban the sale of products made from hemp containing only trace amounts of tetrahydrocannabinols (Hemp Industry Association v. DEA, 333 F.3rd 1082). It was a small step, but it established Goggin as a serious player in civil cannabis law. “Having your name on a federal appellate opinion really helps your credibility,” he said. “The whole cannabis business is just shooting to the moon now,” Goggin said. “The new statewide regs have almost completely transformed my practice.”Goggin’s experience in the interplay between federal law and state statutes landed him a new gig as of counsel to Denver, Colo.-based Hoban & Feola, a cannabis business law firm, to serve as its Northern California regional office. Investors are waiting for the hemp market to turn fully legitimate, Goggin said. In April he met with Rep. Nancy Pelosi’s staff in Washington, D.C. to help clarify that the U.S. Department of Agriculture has jurisdiction over hemp, not the DEA. “Doing so will help free up investment that has stayed on the sidelines until [the] DEA is out of the way,” he said. In Southern California, a partner at a major entertainment law firm licensed Jamaican reggae musician Bob Marley’s name on behalf of his estate to the distributors of a Marley Natural line of marijuana products and accessories. The deal took months to negotiate because of the laws’ complexities, said Bonnie E. Eskenazi of Greenberg Glusker Fields Claman & Machtinger LLP. Aaron Herzberg, a former high-end Orange County divorce lawyer, is general counsel to CalCann Holding Corp., which is planning a $5 million climate-controlled greenhouse for the industrial cultivation of marijuana in Desert Hot Springs, where officials have zoned a pot production center named Pineapple Park. One issue is that federally regulated banks won’t touch pot money, so Herzberg’s company is involved in the alternative banking business. This vacuum has allowed his firm to use its expertise and access to capital to fill the needs of businesses with marijuana licenses. Herzberg says his involvement with the cannabis industry is both personal and professional. Serra, who embodies the pro-pot legal effort, has lived through a decades-long courtroom and ballot box crusade to promote legalization. 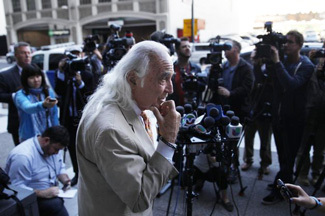 He’s been a lawyer for 54 years, all of them spent partly stoned. Nevertheless, he’s proud to have pursued a civil rights practice representing the likes of Huey Newton and Raymond “Shrimp Boy” Chow. It’s a storied career he offers as Exhibit A to prove pot is not the demon weed. The justice system has steadily moved toward pot acceptance. Last October, Breyer, the district court judge, found cause to reverse the federal anti-pot crusade by pointing to a new congressional budget amendment that advised federal prosecutors to respect state marijuana laws. The judge ordered lifting a federal injunction against one of the state’s oldest dispensaries, the Marin Alliance for Medical Marijuana. The tide turned in May when the U.S. Department of Justice abandoned its four-year crusade to shutter the nation’s largest dispensary, Harborside Health Center in Oakland. Serra says marijuana’s inevitable journey towards legalization has already changed the industry, compromising some of what he found so positive about it. Still, Serra remains busy in cannabis defense. He has a jury trial this month over a client’s possession of 700 plants. Another case in Sacramento involves eight pounds of marijuana. “They’re still fighting, the fools,” he said of state prosecutors. Yet he remains an advocate and a genuine pot enthusiast. “I’ve been successful since 1973, and dope didn’t f--- up my energy or my steel trap mind,” he said.